A 300 degree, sticky glue-type substance exploding in your face is not an ideal day on the job. The result would be third or fourth degree burns, charred skin, numerous surgeries, skin grafting, stacks of medical bills, and many other negative aspects. However, this scenario is a serious potential risk for underground utility workers – until SealGuard, Inc. developed the SealGuard II using Smart Products’ custom built 141 check valve (based on our ½ inch flanged cartridge 14C valve) as a key safety feature. 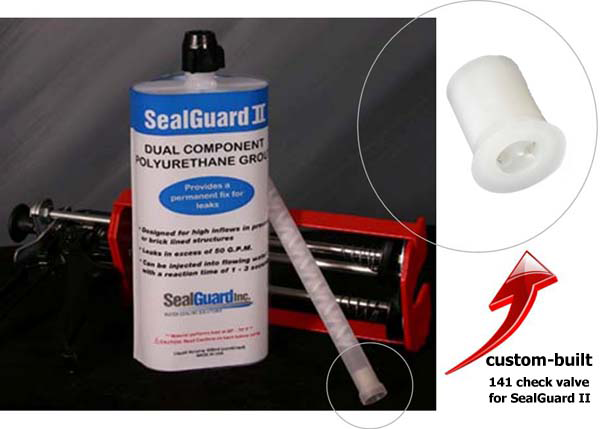 The SealGuard II is a highly reactive dual-component hydrophobic polyurethane water-stop system. It is used to repair leaks for manholes, slurry wall, basements, or anywhere underground. “The SealGuard II is unique to the industry because the 141 valve provides a huge safety component for operators. That’s why we’ve patented this particular valve with our product,” says Bill Hershman, CEO of SealGuard. “Polyurethane is an incredibly sticky substance. When you factor in that people are installing it at 300 degrees of heat, you want it to come out safely – otherwise it would be a very bad day at work,” continues Hershman. When injected, the SealGuard II’s chemical components react and expand up to 20 times, creating a foam seal within the cracks. This process creates up to 300 degrees of heat and is installed at eye-level. The 141 check valve plays a critical role because it keeps the polyurethane in the tube – otherwise there is a risk this dangerous chemical could spew out similar to a shaken soda. In addition, because of the wide variety of body and O-ring materials, we can create material combinations that perform in some of the most demanding environments.